In the spring of 1840, the Navy of the Republic of Texas was immersed in a political battle between President Mirabeau Lamar and his arch-enemy, former president Sam Houston, currently serving as a member of the Texas Congress. The Congress, led by Houston, had already dismantled the Texas Army in an effort to curtail Lamar’s free-spending, expansionist policies, and now they were set on dealing with the Texas Navy in the same manner. Into the midst of this acrimonious struggle, stepped a 28-year-old naval first lieutenant, Edwin Ward Moore, fluent in Spanish, and with 12 years experience in the American Navy. 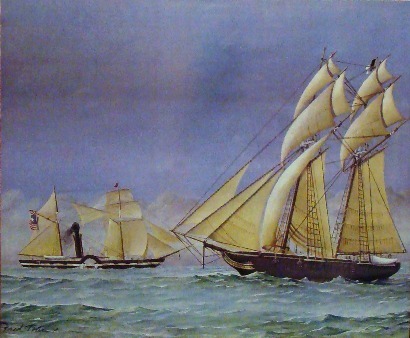 In 1838, a United States squadron of warships, including Edwin Moore’s sloop-of-war Boston, anchored in Galveston Bay. Lieutenant Moore, whose brother already resided in Texas, became intrigued with the efforts of the new Republic to start a navy from scratch. Since prospects for promotion were dim at best in the U.S. Navy of the day, which was both small and out-of-date, Moore decided to take a risk and offer his services to the Republic of Texas. In 1839, he resigned his American naval commission and accepted an appointment as commodore of the new Texas fleet. The majority of the other officers who served in the fleet were also recruited from the U.S. Navy. The first task for the newly promoted Commodore Moore and his officers was to enlist the sailors and marines required to man the fleet. To accomplish this task, Moore traveled to New York, where he set up a recruiting office at the Brooklyn Navy Yard, offering both adventure and prize money for all men who joined the Texas cause. He soon had the seamen he required, only to return to Texas and be caught up in the squabble between Lamar and Houston. However, Moore could plainly see that Lamar’s proposed mission to Mexico had public support, and being unfamiliar with the highly partisan politics of the Republic, he disregarded the strong opposition to his plans by the Houston faction. Eager to apply pressure to the ongoing secret negotiations between Texas and Mexico, Commodore Moore set sail in June 1840, on the flagship Austin, accompanied by the steamship Zavala and three schooners. Moore had little faith in the peace negotiations, and he was determined to deal a blow to Mexico that would bring the Mexicans to heel and force them to recognize the independence of Texas. In support of this goal, he established a blockade of the Mexican coast off the port of Tampico, stopping all incoming and outgoing ships. By fall, it was obvious that the peace negotiations had failed, and with the fleet desperately low on food and fuel, Moore was forced to choose between taking action and sailing home. He chose action, sailing the Austin, the Zavala, and the San Bernard ninety miles up the Tabasco River to the provincial capital of San Juan Bautista, where he negotiated a deal with the Yucatan rebels, who were locked in a struggle with the Mexican government for their own independence. The agreement called for Moore to assist the rebels in capturing the capital in exchange for $25,000, but when the city fell without a shot being fired, the Texans had to seize two rebel ships and hold them for ransom before receiving their money. The fleet sailed for Texas in January 1841. Upon his return to Galveston, Commodore Moore was greeted with the news that Great Britain had formally recognized the Republic of Texas. Moore wanted to return to sea immediately and continue to pressure Mexico, but during a brief meeting with Lamar, the President decided it would be best to wait and allow Britain to try and negotiate a settlement between Mexico and Texas. However, instead of laying up his ships for repair and discharging most of his seamen as Lamar had first suggested, Moore persuaded the President to keep the Navy busy by conducting a survey of the Texas coast. The survey was a complete success, resulting in the first accurate navigation charts of the Gulf of Mexico. With the use of the new charts, shipping losses dropped dramatically and insurance rates fell, providing a boost to the Texas economy. Meanwhile, Mexico had broken off negotiations, and President Lamar and his Secretary of State, Samuel A. Roberts, had become disenchanted with the prospects for peace with the government of Santa Anna. As a result, Lamar launched his ill-fated expedition to Santa Fe and entered into secret negotiations with Yucatan to form an alliance against Mexico. In 1838, an insurrection had begun in Yucatan. The rebels were deeply dissatisfied with the dictatorial methods of Santa Anna, and in 1840 the local assembly, like its new Texas ally, had declared independence and drafted a constitution based on the Mexican Constitution of 1824. In September 1841, a deal was struck between Yucatan and Texas, whereby Yucatan agreed to pay Texas $8000 a month for the use of three ships to defend its coastline against Mexican raiding. All proceeds from any prize ships taken in the operation would be split. Commodore Moore was given command, with orders to capture Mexican towns and demand ransom payments for their return. In order to enforce payment, Moore was authorized to destroy public works and seize public property. However, speed was of the essence if the operation was to be implemented. Sam Houston had just been reelected President of the Republic, and Lamar and Moore feared that, if given the opportunity, he would cancel the agreement with Yucatan as soon as he took office. On December 15, two days after being sworn in as President of the Republic, Sam Houston issued an order canceling the Yucatan operation, but the order arrived too late. The Austin, the San Antonio, and the San Bernard had already set sail for Sisal, Yucatan. Commodore Moore was fully aware that his mission did not have the approval of President Houston. After his departure, he wrote to his good friend, General Albert Sydney Johnston, that he would most likely be recalled at the earliest opportunity and subjected to vicious political attacks by the supporters of Sam Houston. When the fleet arrived in Sisal, Moore discovered that Yucatan was in the middle of negotiations with Mexico to end the rebellion. 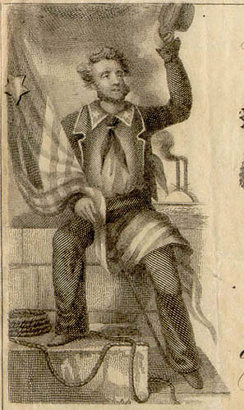 Realizing that an end to the hostilities would threaten the security of Texas, he persuaded the Yucatan officials to keep their agreement with the Texas Navy until they were certain that Mexico, and more importantly the wily Santa Anna, were sincere about wanting a peaceful settlement. He immediately sent the San Antonio back to Texas with a detailed report for President Houston, and included an urgent request that the steamship Zavala be repaired as soon as possible and sent south to reinforce the Texas fleet. Unfortunately, Texas had only a small navy yard and no one with the technical expertise to repair the steamship, and it was never sent. Continuing the operation, Moore captured several Mexican ships, before receiving news that convinced him he was following the right course. Word reached the fleet that the Texas prisoners, taken as a result of Lamar’s Santa Fe expedition, had been brutally forced marched the entire 1500 miles to Mexico City, where the few survivors had been thrown into prison. To make matters worse, Santa Anna had ordered an incursion into Texas by General Raphael Vasquez that resulted in the brief occupation of San Antonio. Unknown to Moore, President Houston had issued orders to maintain the blockade of the Mexican coast, retroactively approving the fleet’s actions. Moore continued his depredations of Mexican shipping in and around the vital port of Veracruz, until April 1842, when low on money and supplies, and with the men’s terms of enlistment running out, he sailed for New Orleans. While in New Orleans tending to the repair and refit of his ships, Commodore Moore received orders to return to Texas. In May, Moore met with President Houston in Galveston, where he learned that Houston planned to withhold the $20,000 Congress had appropriated for the Texas Navy. Moore failed to understand Houston’s motives. Publicly, the man was calling for volunteers to avenge the Santa Fe disaster and the sack of San Antonio by Mexican troops, but privately, he appeared to favor a different course. The President had rescinded his blockade order just nineteen days after sending it to Moore, and then after telling Moore he wanted him to lead an invasion of Tampico, he had failed to call Congress into session in time to approve it. By July, Moore had come to despise Houston’s constant wavering, accusing the President of “humbug” and considering resigning “in disgust,” however he later wrote that he “still hoped to redeem the enterprise from failure, which was so important to the salvation of my country.” Relying on the hope of prize money and help from Yucatan, Moore used his own credit to equip and provision the fleet. While back in New Orleans, Moore received conflicting orders. He was told to sail at once and begin to prey upon Mexican shipping, hoping that his actions would force the Mexicans to resume negotiations. He was also told to bring the fleet back to Galveston, if he could not find the additional funds necessary to make the ships seaworthy. While contemplating which course to follow, Moore received word from his friends in Texas that Houston was planning to sell the Texas Navy, and that the President had delivered a secret message to Congress accusing the Commodore of malfeasance with naval funds. Moore had incurred more than $35,000 in personal debt attempting to keep the fleet at sea, and although he was outraged by Houston’s accusations, he still wanted to continue the mission. Once again the government of Yucatan came to Moore’s assistance, offering an agreement similar to the one they had made with President Lamar two years previously. For a payment of $8000 a month, the Texas Navy would break the Mexican blockade and continue to patrol the coast off Yucatan until it was free of Mexican warships. The Austin and the Wharton sailed on April 15, 1843, and with Morgan’s concurrence, set a course directly for Yucatan, bypassing Texas. On the morning of April 30, the Texas vessels and two Yucatan ships, along with five small gunboats, engaged six Mexican vessels, including the new steamships Mocteczuma and Guadaloupe. The fighting was hot and heavy, with one broadside after another exchanged throughout the course of the morning, but the battle proved inconclusive. The Mexicans withdrew, but later in the day, with the Texans now nearing the port of Campeche, the battle resumed. During the heavy fighting that followed, the Texans suffered only two killed and three wounded, while the Mexicans lost twenty-one killed and thirty wounded. Houston had issued a public proclamation on May 6, in Texas, denouncing Moore and charging him with mutiny, treason, and piracy. In the proclamation, Moore was further charged with disobedience and violation of Texas law. In addition, the Commodore was suspended from duty and ordered to return to Texas immediately for court-martial. 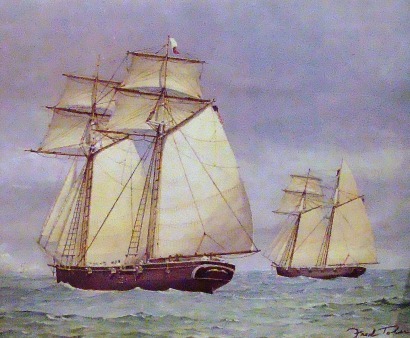 When Morgan reached Moore with the news on June 1, the two men decided to make for home where they would hold Houston to his word and demand a trial in which the Commodore would have an opportunity to explain his actions and clear his good name. On July 14, Commodore Moore arrived in Galveston where he received a hero’s welcome. As far as the public was concerned, Moore had defended Texas and avoided a potential disaster. The people burned a figure of Houston in effigy during the celebration. Sam Houston, however, was unmoved by Moore’s public support. The Texas seamen were dismissed, Colonel Morgan was fired as a commissioner, and Commodore Moore was given a dishonorable discharge from the Texas Navy. After publishing a 200-page pamphlet documenting his actions, a Congressional investigation found that Moore had been illegally dismissed and, therefore, entitled to a court martial. The trial lasted 72 days and in the end, Commodore Moore was convicted of only four minor counts of disobedience. President Houston, along with the citizens of Texas, considered the verdict a complete victory for Moore, and he angrily vacated the findings of the court. Saga of a Texas Ranger is Mr. Robenalt's first novel, however, the second volume in the saga, Star Over Texas, will soon be ready for publication. References for "The Yucatan Adventure"
Dienst, Alex (1987); The Navy of the Republic of Texas, 1835-1845; Fort Collins, Colorado: The Old Army Press (originally published 1909). Douglas, C.L. (1973); Thunder on the Gulf; Fort Collins, Colorado: The Old Army Press (originally published 1936). Hill, Jim Dan (1982); The Texas Navy: In Forgotten Battles and Shirtsleeve Diplomacy; Austin: State House Press (originally published 1937). Jordan, Jonathan (2006); Lone Star Navy: Texas, the Fight for the Gulf of Mexico and the Shaping of the American West; Washington D.C.: Potomac Books; ISBN 973-1-57488-512-5. Meed, Douglas (2001); The Fighting Texas Navy, 1832-1843; Plano, TX: Republic of Texas Press; ISBN 973-1-55622-3. Wells, Tom Henderson (1988); Commodore Moore and the Texas Navy; Austin, TX: University of Texas Press; ISBN 973-0-292-71118-1. The Handbook of Texas Online: Texas Navy. Texas State Library and Archives Commission: https://www.tsl.state.tx.us/exhibits/navy/moore.html.